Mitchell Stockton "Sox" Mulford was born in June 21, 1886 in Sharon Hill, Pennsylvania. His father, Stiles Elton Mulford, was born in 1856 in Philadelphia. His mother, Sarah Jane Aumack, was born in 1857 in New Jersey. His parents married in 1881 and had three children, Alice (b.1882), Stockton (b.1886) and Marie (b.1890). The father was a successful life insurance salesman. In 1889 the family moved to San Francisco, California, and they moved again in 1891 to Portland, Oregon, where the father became his insurance company's regional supervisor. 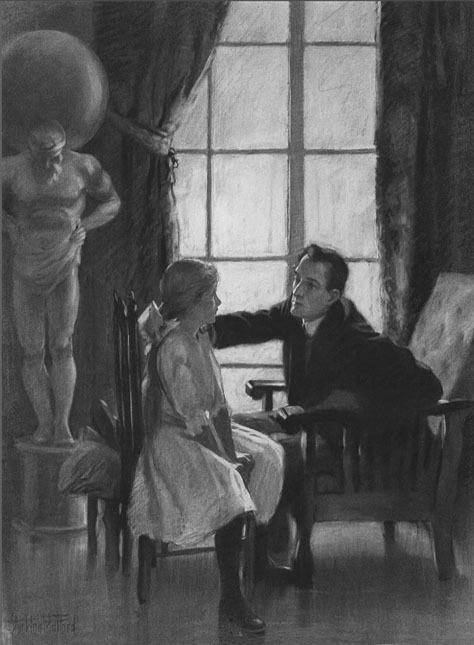 In 1893, at the age of seven, while attending school, Stockton was pushed into a metal hinge that projected from a window frame and was blinded in the right eye. After recovery he was fitted with a glass eye. He had been drawing pictures since he was a small child, and in 1895 his father gave him a professional painter's easel, which helped to substantiate his self-image as a genuine artist. In 1898 his father died of an aortic aneurysm at age forty-two. In 1900 the widowed mother and her three children lived in a boarding house at 343 Tenth Street in Portland, Oregon, where a portion of the rent was offset by contributing to the housekeeping chores. In 1903 at age seventeen Stockton left high school in his junior year and went to sea as a bridge boy in the U.S. Transport Service. According to the artist, "After my experience on the sea, I couldn't settle down to studies. The two things that interested me most were adventure and art, and art won the fight." He graduated high school in 1905 but could not afford to enroll in art school full-time, so he began to work as a bank clerk and to attend only weekend art classes. After following this routine for two frustrating years, he gave up his bank job in 1907 and moved to New York City to study at the Art Students League. He lived at 202 East 18th Street in NYC. 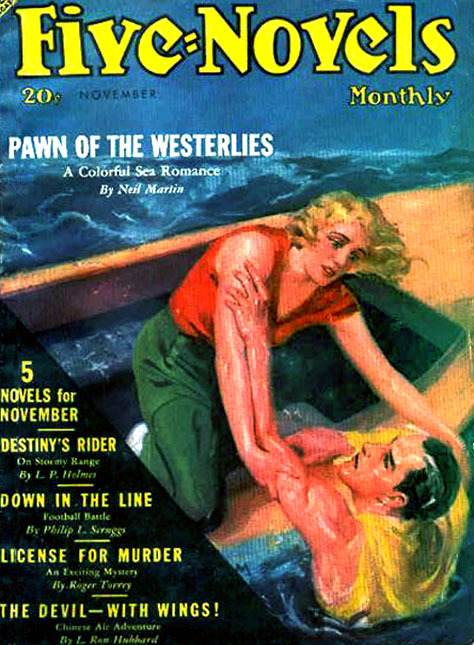 At first he attended classes and tried to sell freelance illustrations to New York publishers, but after failing to sell enough paintings to support himself, he again found full-time employment as a bank clerk, and only took night classes. 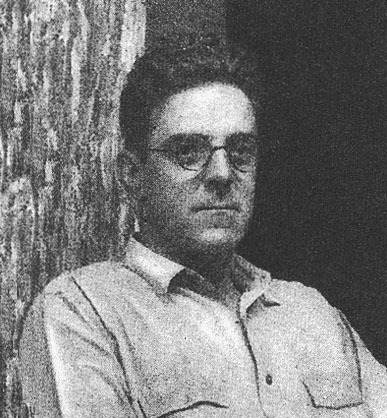 At the Art Students League he met Georgia O'Keeffe and in 1912 he met and fell in love with another young artist named Mina Ivanek, an immigrant from Austria Bohemia, who was born in 1887 in France. She came to the U.S. at the age of five in 1892 and became a citizen in 1902. 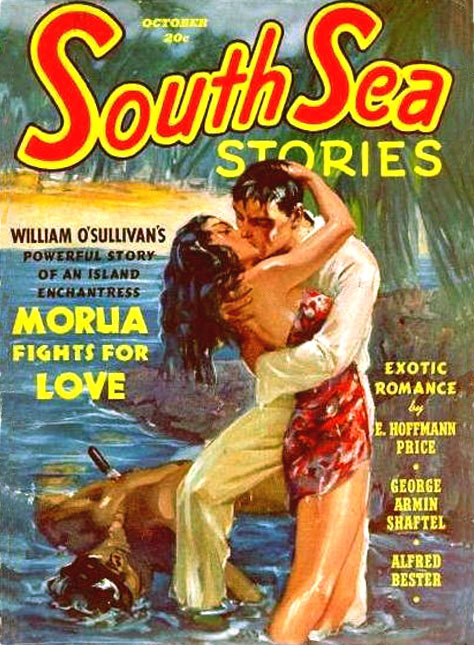 In the Summer of 1910, Stockton and Mina married. They moved to a large apartment building in the Bronx at 3004 Heath Avenue. Their son Roger Mulford was born in 1913 and their daughter Mina "Alice" Mulford was born in 1914, and a second daughter, Phyllis, was born in 1920. His elderly widowed mother also came to live with them. 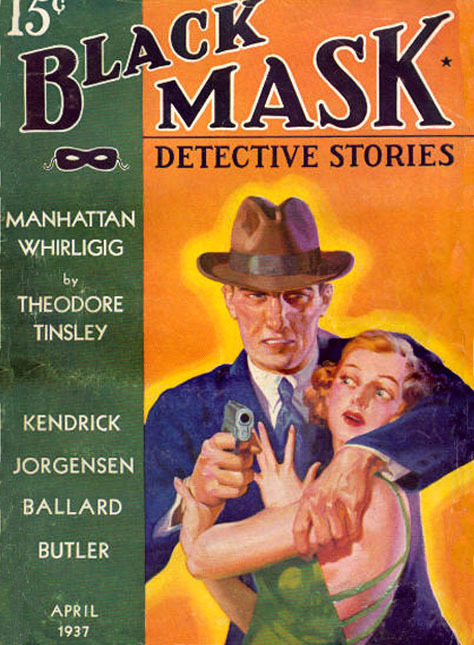 He found the apartment through his best friend, Harry T. Fisk (1887-1974), another pulp artist who lived with his elderly mother in the same building. 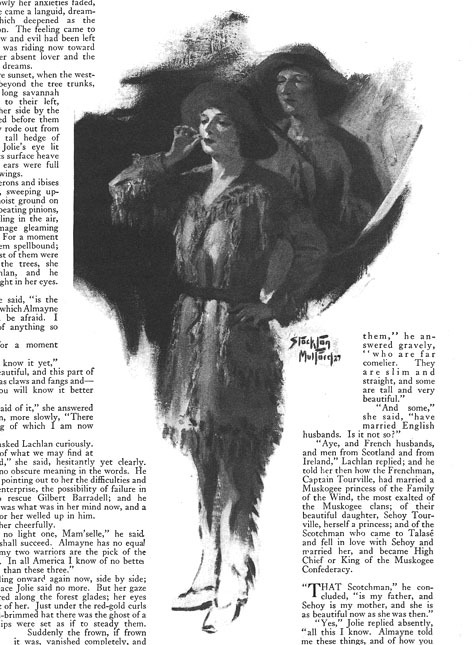 By 1913 he had begun to sell an increasing number of freelance illustrations in his spare time. One helpful art editor advised him to give up his bank job and focus on his painting career, saying, "Mulford! You might as well decide right now whether you want to be an artist or a banker!" He accepted the challenge and decided to become a full-time freelance artist. 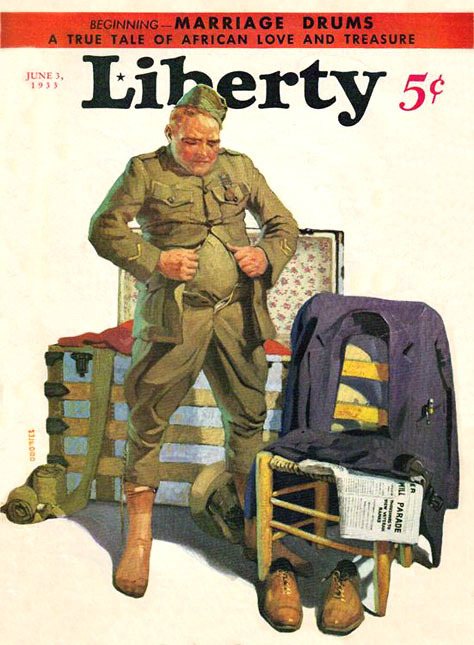 He was soon selling work to The Christian Herald, The New York Herald Tribune, People's Home Journal, and Every Week. 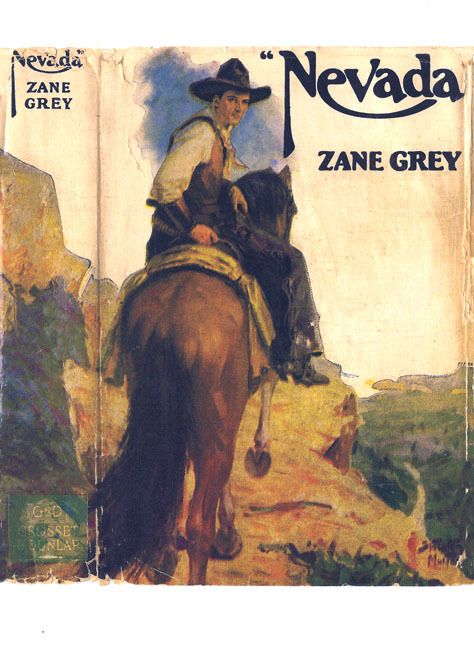 He was also illustrated books and painted book covers for Harpers & Brothers and Houghton Mifflin Company. 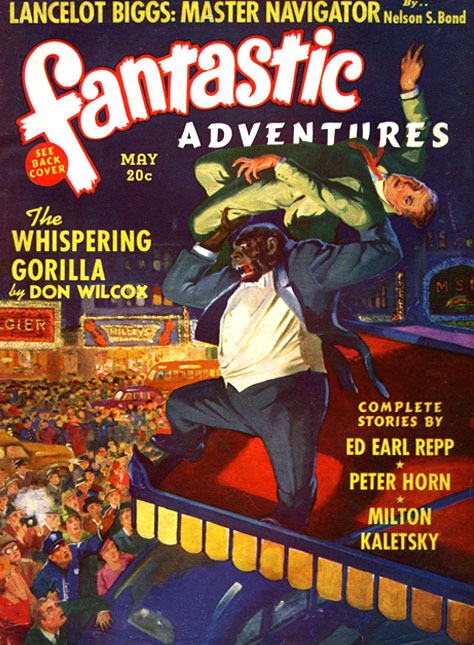 Stockton Mulford and Harry T. Fisk both worked for the same pulp magazines, such as Everybody's Magazine, Argosy, The Popular, Complete Story, Top-Notch, Battle Stories, and Clues. In 1918 Stockton did not serve in the Great War because of the blindness in his right eye. He is recorded at the time of his draft registration to be 5'-11" and weight 172 lbs. Light complexion, brown hair and brown eyes. In 1920, with no remnant ambivalence about his identity as a bank clerk, Stockton Mulford officially listed himself with the U.S. Census as an "artist" who worked at his "own studio." That art studio was at 364 West 23rd Street, in the Chelsea district of Manhattan. 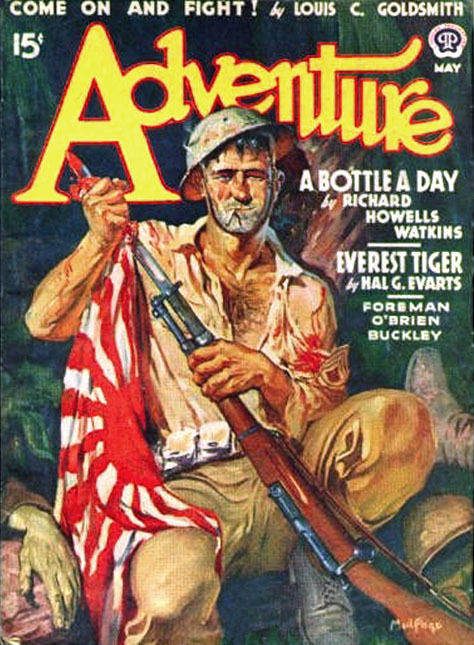 The whole family also lived in the studio, where he created freelance pulp covers for Munsey's Magazine, Argosy, Over The Top, Excitement, Five Novels Monthly, Fantastic Adventures, Amazing Stories, South Sea Stories, Adventure, Western Aces, and Western Trails. 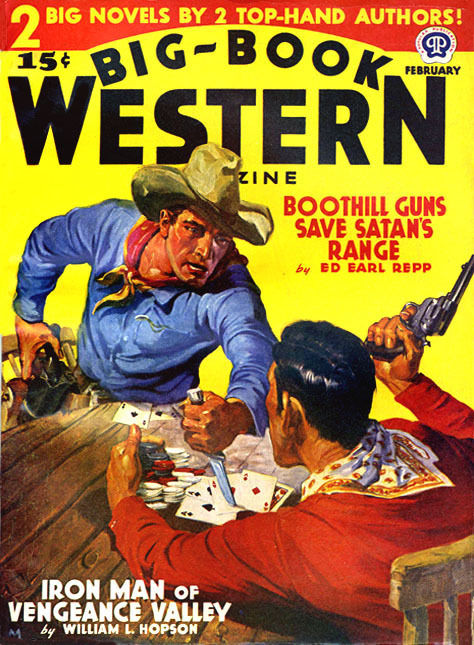 As his career progressed he began to receive regular assignments from slick magazines, such as Liberty, McCall's, The American Magazine, and The Saturday Evening Post. 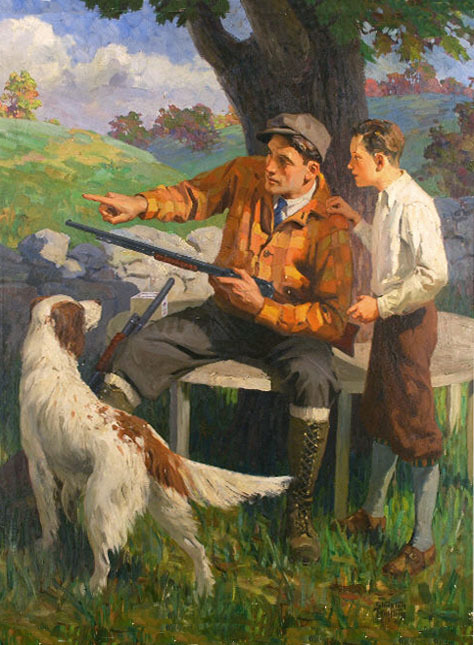 In 1926 Stockton Mulford purchased a summer home in Sandy Hook, Connecticut, which is near to Newtown in Fairfield County. The home was a 200-year-old farmhouse. In 1930 the family lived at 315 West 79th Street, which they rented for $141 monthly. 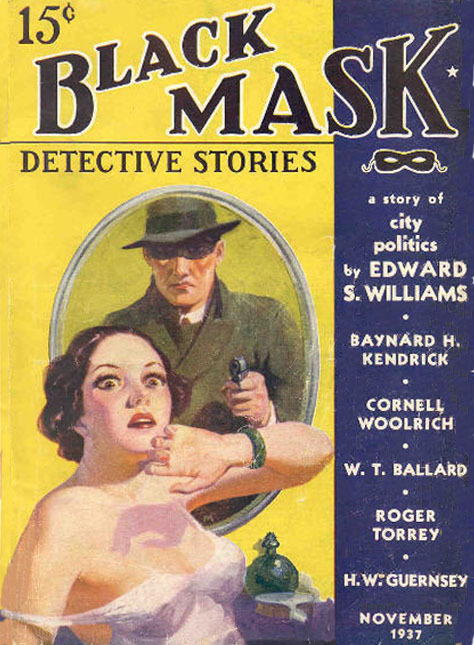 In 1933 Stockton Mulford was able to supplement his income by producing additional illustrations under the pen-name "Ray Dean." 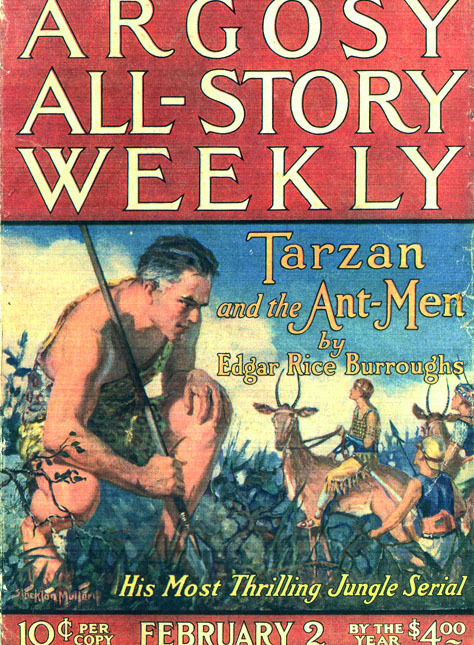 This work was published through an art agency with Adventure Magazine, Star Western, and Liberty Magazine, where he illustrated serialized chapters of "Tarzan And The Lion Man" by Edgar Rice Burroughs. 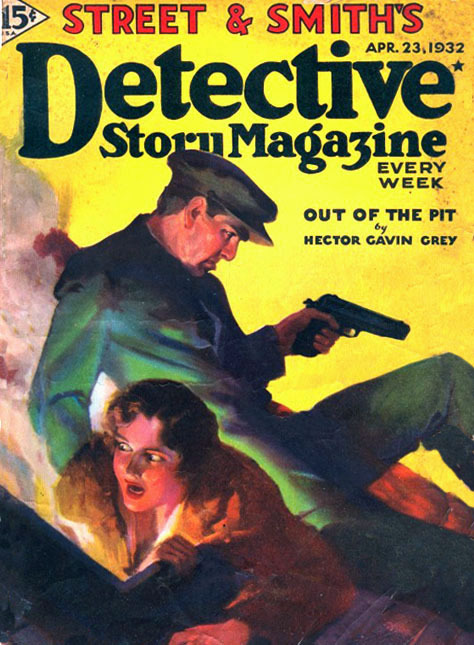 After 1935 Stockton Mulford never again used the pen-name "Ray Dean." By 1943 the Mulford children had grown up and left home to start their own careers and families. According to the artist's grandson, Rick Phillips, "Roger Mulford graduated from Cornell University and served in the army during WWII. Mina "Alice" Mulford graduated from Cooper Union and became a fashion artist under the professional name, Kit Mulford. Phyllis Mulford became a registered nurse and also served in the military during WWII." So in 1945, with an empty nest, the artist and his wife left NYC to permanently live in their summer home at Sandy Hook, CT. In 1946 at the age of sixty Stockton Mulford retired from illustration and instead concentrated on restoring his antique home. His best friend, Harry T. Fisk, was a regular visitor at the home in Sandy Hook, CT. He became an expert cabinet maker, and enjoyed creating intricately-detailed replicas of period furniture from local museum collections. He also became a respected community leader on the Town Board. Mitch Stockton "Sox" Mulford died in his sleep of an aortic aneurysm (the same hereditary ailment that took his father's life) at age seventy-four on September 20, 1960.